The application is open until March 31, 2017. 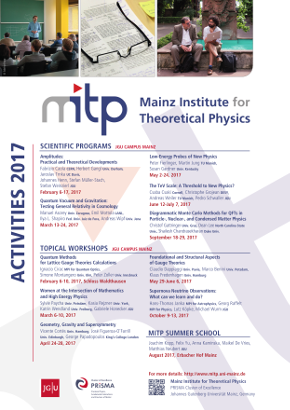 The Mainz Institute for Theoretical Physics will host a summer school for Ph.D. students in theoretical physics. Attendance will be limited to 50-60 students, who will be hosted at the Erbacher Hof in downtown Mainz. The theme for the second summer school is "Joint Challenges for Cosmology and Colliders," which will focus on the biggest open questions in cosmology and complementary probes at the LHC. The school is primarily focused on astrophysics and collider physics, including driving questions about dark matter, neutrino physics, baryogenesis, the Higgs mechanism, the strong CP problem, and the cosmological history of the universe. The lecture schedule will be complemented by discussion sessions and social activities to encourage networking and a vivid exchange of ideas. Applicants should be in the later stages of their Ph.D. career and are expected to commit to the full three week program.